SI leader Zoe Terwilliger explains aspects of human anatomy during a supplemental instruction session. (NEW ALBANY, Ind. )—Zoe Terwiliger is a bright spot in the lives of many students. Alert, cheerful, patient and supportive, the graduating senior guides them through the daunting labyrinth of basic human anatomy. The students ask tough questions, offer random thoughts, laugh at a joke about something that happened in class, bear down on a particularly challenging concept, nod in understanding, and move on to the next chapter. At times it seems more like a study group among good friends than a tutoring session. Terwiliger is not a teacher. She’s a part of a crack team of academic interventionists who deliver supplemental instruction—SI for short—to students in need of extra help. SI provides regularly scheduled, out-of-class study sessions for students enrolled in historically difficult courses ranging from general chemistry and college algebra to financial accounting and mammalian physiology. SI is provided to students who want to improve their understanding of course material and improve their grades. The Student Success Center partners with faculty to provide these sessions which are voluntary, free, and facilitated by a trained peer SI leader. In any given semester, there are 42-48 SI leaders at IU Southeast, trained and overseen by Ryan Norwood, director of the Student Success Center. They are drawn from current and graduating students, along with some faculty members. Some are recommended or even cultivated by professors, some just show up, having heard about the program from a friend. Terwiliger signed on after her own positive experience with the program. Terwiliger did so well in the course that her professor and SI both recommended her to Norwood. Training consists of both online and in-person sessions. Norwood used to work with a manual but became dissatisfied and, frankly, bored with it. “After doing it for so long, I can now see where students are going to struggle,” Norwood said. He now structures training like an SI session—a conversation in which experienced SI leaders and newbies develop scenarios around three central issues: planning, the relationship with faculty, and the relationship with students. The goal is to become flexible enough to handle the distinctive needs and personality of each group, the particular informational demands of each subject or course, and the expectations and vision of each faculty member. In Norwood’s experience, the best preparation is actually performing the task. “Until you get into the water, you don’t really know how to swim,” Norwood said. SI leaders have to demonstrate mastery of course content, and it helps if they’ve performed well in the course themselves, and if they have a good relationship with faculty. Aside from that, the student has to have “the right stuff” to create a climate that is rigorous but relaxed, personal but productive. That ability to bridge the teacher-student divide is critical. In contrast to individual tutors, who are often more focused on the subject matter, SI leaders function as a conducting agent that maintains a circuit between students, the subject matter and the course instructor. SI leaders receive a scholarship worth $900, but given their degree of commitment, they are clearly motivated by more than cash. As for students, the benefits are clear. Norwood’s data suggests that students who attend SI sessions increase their course performance from one-half to one full letter grade compared to those who do not attend, while the drop-withdraw-fail rate for students who attend is 15 percent better. 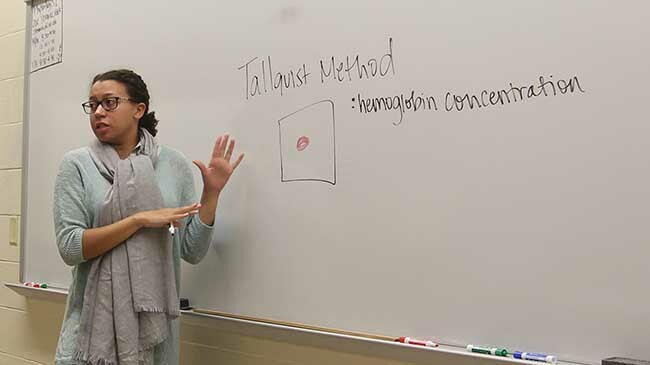 Homepage photo: SI leader Macy Plais leads a discussion in a supplemental instruction session devoted to biology.